Centene Corp (NYSE:CNC) was in 56 hedge funds’ portfolios at the end of the fourth quarter of 2018. CNC shareholders have witnessed an increase in activity from the world’s largest hedge funds in recent months. 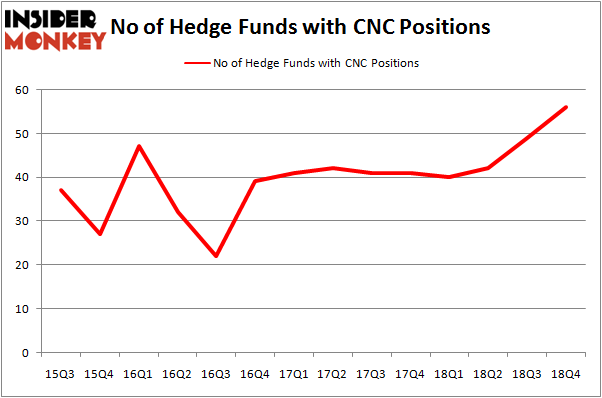 There were 49 hedge funds in our database with CNC positions at the end of the previous quarter. Our calculations also showed that CNC isn’t among the 30 most popular stocks among hedge funds. 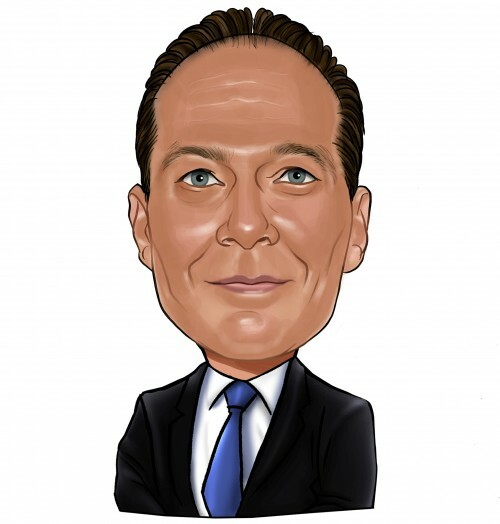 Let’s analyze the fresh hedge fund action surrounding Centene Corp (NYSE:CNC). What have hedge funds been doing with Centene Corp (NYSE:CNC)? At the end of the fourth quarter, a total of 56 of the hedge funds tracked by Insider Monkey held long positions in this stock, a change of 14% from the second quarter of 2018. Below, you can check out the change in hedge fund sentiment towards CNC over the last 14 quarters. With hedgies’ sentiment swirling, there exists a few noteworthy hedge fund managers who were adding to their stakes considerably (or already accumulated large positions). According to publicly available hedge fund and institutional investor holdings data compiled by Insider Monkey, AQR Capital Management, managed by Cliff Asness, holds the number one position in Centene Corp (NYSE:CNC). AQR Capital Management has a $282.4 million position in the stock, comprising 0.3% of its 13F portfolio. On AQR Capital Management’s heels is Lee Ainslie of Maverick Capital, with a $208 million position; 3.1% of its 13F portfolio is allocated to the stock. Some other members of the smart money with similar optimism encompass Noam Gottesman’s GLG Partners, Andreas Halvorsen’s Viking Global and Peter Rathjens, Bruce Clarke and John Campbell’s Arrowstreet Capital. As aggregate interest increased, key money managers were breaking ground themselves. Eminence Capital, managed by Ricky Sandler, assembled the largest position in Centene Corp (NYSE:CNC). Eminence Capital had $56.2 million invested in the company at the end of the quarter. Barry Rosenstein’s JANA Partners also made a $46.2 million investment in the stock during the quarter. The other funds with brand new CNC positions are Tony Davis’s Inherent Group, Alok Agrawal’s Bloom Tree Partners, and Arthur B Cohen and Joseph Healey’s Healthcor Management LP. Let’s also examine hedge fund activity in other stocks similar to Centene Corp (NYSE:CNC). These stocks are Sprint Corporation (NYSE:S), Baker Hughes, a GE company (NYSE:BHGE), Republic Services, Inc. (NYSE:RSG), and Paychex, Inc. (NASDAQ:PAYX). This group of stocks’ market values are closest to CNC’s market value. As you can see these stocks had an average of 28 hedge funds with bullish positions and the average amount invested in these stocks was $708 million. That figure was $1639 million in CNC’s case. Republic Services, Inc. (NYSE:RSG) is the most popular stock in this table. On the other hand Sprint Corporation (NYSE:S) is the least popular one with only 24 bullish hedge fund positions. Compared to these stocks Centene Corp (NYSE:CNC) is more popular among hedge funds. Our calculations showed that top 15 most popular stocks among hedge funds returned 19.7% through March 15th and outperformed the S&P 500 ETF (SPY) by 6.6 percentage points. Unfortunately CNC wasn’t in this group. New hedge funds that bet on CNC were disappointed as the stock returned 2.6% and underperformed the market. If you are interested in investing in large cap stocks, you should check out the top 15 hedge fund stocks as 13 of these outperformed the market. Were Hedge Funds Right About Souring On Canon Inc. (NYSE:CAJ)? Here is What Hedge Funds Think About BT Group plc (BT) Here is What Hedge Funds Think About AutoZone Inc. (AZO) Hedge Funds Dropped The Ball On Fortive Corporation (FTV) Were Hedge Funds Right About Flocking Into Sempra Energy (SRE)? Is IQVIA Holdings, Inc. (IQV) A Good Stock To Buy?